Content Marketing World 2012: Content, Convergence and ... Cage Match? This year’s Content Marketing World 2012 conference had to be one of the best events of the year for marketing professionals. If you are not familiar with CM World, it’s the largest gathering of content marketing professionals in the world, bringing together 1,000+ engaged attendees, industry speakers from Google, SAP, Intel, and a proverbial who’s who of expert authors including Mitch Joel (“Six Pixels of Separation”), C.C. Chapman (“Content Rules”), Andrew David (“Brandscaping”), and of course, Joe Pulizzi, "the godfather of content marketing" and founder of the Content Marketing Institute. Here are some highlights from the conference. Content - Must Know Why and Who? Author Jay Baer really nailed this topic in his presentation, The Ultimate Guide to Content Marketing Metrics. The session addressed two critical mistakes many marketers make with their content strategy: not having clear goals for their content and not really knowing their target audience. Jay’s advice, which we can all learn from, is to know why you are doing content. Outline your goals before trying to create content because the type of content you make and the metrics you use to measure rely on the answer to “why.” Also, map content to the buyer’s purchasing cycle and map metrics to content type. Convergence - Paid, Earned and Owned Andrew Davis, author of the game-changing book, “Brandscaping,” hit on this idea in his session called Brandscaping: The Secret to Unlocking Bigger Content Marketing Budgets and Driving Faster Results. A great lesson for marketers was that if you want to raise awareness, buy ads … if you want to increase demand, create content. This point echoed a theme shared throughout the conference, which is that marketers must start thinking about how paid, earned and owned media work together in an integrated strategy. Cage Match? There’s no doubt that the folks at CM World like to keep things interesting. This year the conference included a “cage match” in which eight technology vendors had to present a creative overview of their solution in four minutes or less. The session was moderated by the always entertaining Robert Rose (author of “Managing Content Marketing”), who used the opportunity to joke with vendors and the audience, and even connect a mock skype call with Charlie Sheen. 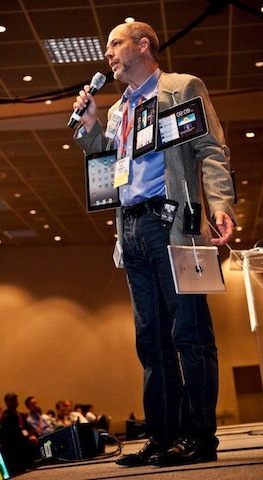 To really drive home the point that Brightcove helps you reach your mobile audience, I decided to present my session wearing a suit of dangling devices with over 20+ iphones, ipads and Android devices attached (photo below). More to come! If you missed this year’s CM World conference, we hope you can join us next year. If you would like to learn more about the topics covered at the event, Content Marketing Institute, Marketing Profs and Brightcove are finalizing a great new research report on the state of content marketing and industry best practices. Stay tuned!